Unfortunately, like the regular Versace line, the purses are the line’s low point. The collection includes a dress and jacket made out of real leather, which could possibly indicate that some of the bags are genuine as well (although I couldn’t find anything indicating their fabrication), but the hardware removes any doubt that what you’re carrying is from H&M. 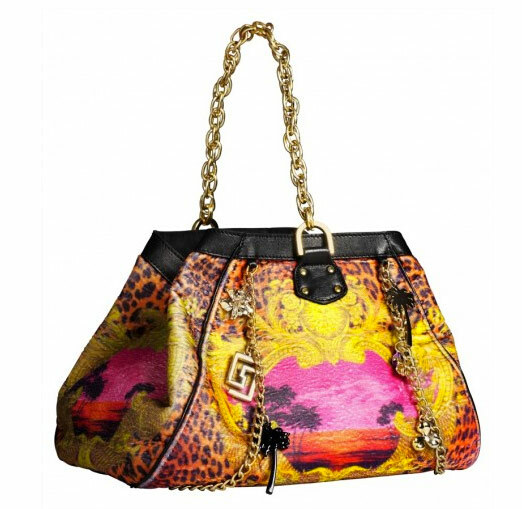 The rest of the collection has some very fun, colorful pieces, but the handbags just aren’t among them. As far as prices go, I could only find the price information for one of them – the small black studded bag, which worked out to about $110 from the British price list on which I found it. Pictures of the rest of the bags are after the jump.